The Eurasian Oystercatcher (Haematopus ostralegus), generally known in Europe as just Oystercatcher, is one of the largest waders in the region. The adults are very noisy birds with a conspicuous black and white plumage, red legs and strong broad red bill, which they use for hammering, stabbing or prizing open molluscs such as mussels or cockles, or for probing for worms. Young birds are more brown, have a white neck collar and a duller bill. Oystercatchers are very long-lived, the record being a female more than 43 years old, caught on the nest. 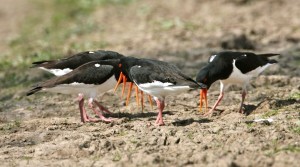 Two pairs of Oystercatchers in a border dispute, performing the characteristic piping display. Foto Koos Dansen. During the breeding season, pairs aggressively defend their territory against neighbouring pairs. Male and female also share parental duties equally: incubating the eggs, brooding the young chicks, chasing potential predators and provisioning the chicks until well after fledging. Usually, male and female return to the same mate and territory year after year. A minority of pairs divorce though and on rare occasions, polygynous trio’s form. Oystercatchers survive the winter on intertidal mud flats, with cockles and mussels being their staple food. 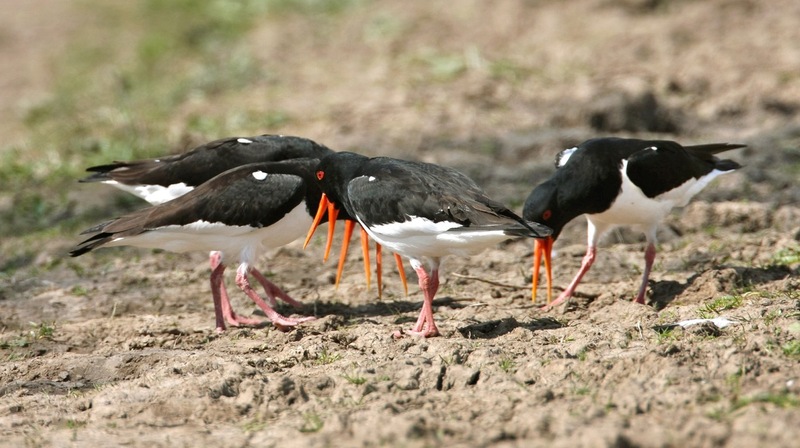 Although the Oystercatcher is originally a coastal bird, in the Netherlands only a minority stays to breed on saltmarshes fringing the intertidal areas. The majority migrates to breed inland in fields and meadows. Some birds breed in urban areas on flat roofs, feeding on nearby lawns and soccer fields. Because of its large numbers, readily identified behaviour, and easily sampled prey, the Oystercatcher has become a model species in studies that seek to link the behaviour of individuals to the dynamics of populations. As a result, the Oystercatcher is the best studied shorebird in the world according to the Web of Science. Long-term population studies of individually marked birds have allowed us to assess the population consequences of climate change. Blomert A-M, Ens BJ, Goss-Custard JD, Hulscher JB, Zwarts L. 1996. Oystercatchers and their estuarine food supplies. Ardea. 84A:1-538. Ens BJ, Kersten M, Brenninkmeijer A, Hulscher JB. 1992. Territory quality, parental effort and reproductive success of Oystercatcher (Haematopus ostralegus). J Anim Ecol. 61:703-715. Ens BJ, Weissing FJ, Drent RH. 1995. The despotic distribution and deferred maturity: two sides of the same coin. Am Nat. 146:625-650. Goss-Custard JD. 1996. The Oystercatcher: From Individuals to Populations. Oxford: Oxford University Press. van de Pol M, Bruinzeel LW, Heg D, Van der Jeugd HP, Verhulst S. 2006. A silver spoon for a golden future: long-term effects of natal origin on fitness prospects of oystercatchers (Haematopus ostralegus). J Anim Ecol. 75:616-626.
van de Pol M, Pen I, Heg D, Weissing FJ. 2007. Variation in habitat chioce and delayed reproduction: adaptive queuing strategies or individual quality differences? Am Nat. 170:530-541.
van de Pol M, Vindenes Y, Sæther B-E, Engen S, Ens BJ, Oosterbeek K, Tinbergen JM. 2010. Effects of climate change and variability on population dynamics in a long-lived shorebird. Ecology. 91:1192-1204.